Surrounded by donations, the Coast Guard unit listens to an update on the shutdown. 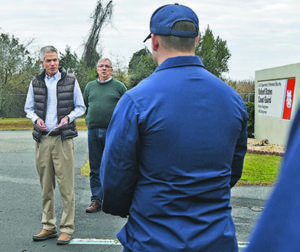 The shutdown of the federal government now in its fifth week may seem like a far away problem to most of the residents of Georgetown County, but it’s hitting home at Coast Guard Station Georgetown. There are 40 guardsmen stationed in Georgetown, and more than 30 of them have families to support. Senior Chief Boatswain’s Mate Justin Pickler, the officer in charge, said many of them are the sole breadwinners of young families and are living paycheck to paycheck with a fear of not being able to pay their rent and utilities. People around the county have collected gift cards, food and diapers for the guardsmen’s families. A delegation from area churches, nonprofits and veterans groups stopped by the station on Wednesday morning to thank the crew for their service and drop off donations. They were greeted by the station’s entire crew. George Furbee, commander of VFW Post 644 in Georgetown, brought a check and some gift cards. When Furbee was serving in the Navy and deployed to the Mediterranean, the government shut down for two weeks. He has an idea what the guardsmen are going through. He and other members of the VFW plan to return to the station on Saturday with more donations. John Bush, director of Helping Hands Georgetown County, presents donations to the Coast Guard unit. John Bush, executive director of Helping Hands of Georgetown, gave a donation and flyers with information about how his organization could help with things such as food and utility payments. Bush said the fact that the entire unit was on hand when the donations were made was a good thing. “Anything that can help alleviate that, whether it’s the food, whether it’s gas cards, whether it’s any of that that we’ve been getting in is just easing that burden for the guys a little bit more,” Pickler said. 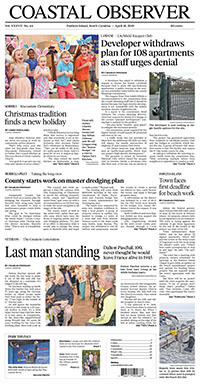 Others around the county are also helping. The Baskervill Food Pantry at Holy Cross-Faith Memorial Episcopal Church also put out an invitation to federal government workers who need assistance. The Pantry is open Monday through Friday from 9 a.m. to noon and Thursday from 4:30 to 6:30 p.m. Only a photo ID is required to get help. The Lachicotte Co. was also collecting groceries for the Coast Guard station at its real estate office on Highway 17 in Pawleys Island. The Georgetown Business Association had two collection points on Front Street for nonperishable foods or grocery store gift cards: Miss Lizzies at 811 Front St. and Bienvenue Home Decor at 814 Front St. 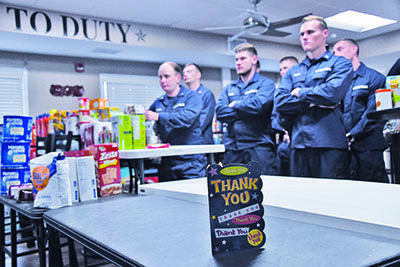 They are open Monday through Saturday, 10 a.m. to 5 p.m.
After Pickler accepted the checks from the veterans, clergy and Helping Hands on Wednesday, there was a discussion among the guardsmen about the Coast Guard being transferred into the Department of Navy so everybody could start getting paid again. The Navy and the president can make that decision during peacetime. Only Congress can authorize a transfer during times of war. The partial shutdown of the government began Dec. 22. More than 400,000 workers who are considered “essential” have been forced to continue to work without pay. Another 380,000 are furloughed. Other affected workers include U.S. Marshals, FBI and TSA agents, Border Patrol officers, and Forest Service firefighters. It is unclear how long the shutdown will last. Pickler called it “uncertain times,” adding that he’s been flexible with his schedule so the guardsmen can work second jobs. “We’re constantly watching the news to pick up information where we can and doing what we can to make ends meet right now,” he said. Admiral Karl Schultz, commandant of the Coast Guard, tweeted his support for his men and women on Tuesday. Schultz wrote: “Your Coast Guard leadership team & the American people stand in awe of your continued dedication to duty, resilience, & that of your families. I find it unacceptable that @USCG members must rely on food pantries & donations to get through day-to-day life.